A current first company dancer with Charlotte Ballet, Alston initially taught himself to dance by watching YouTube videos and joining dance classes at his high school. At age 16, he traveled from Texas to North Carolina to attended an American Ballet Theatre summer intensive and was introduced to UNCSA for the first time. His vision was clear: he would become a professional ballet dancer, and UNCSA would be the school to help him achieve his goals. “I clicked on every link on the website, read every handbook and researched the faculty,” he recalls. “I reached out to alumni through social media and talked with current students and staff while I was on campus.” After thoroughly educating himself about UNCSA, it was the small class sizes and the quality of the training that stood out and helped to fuel Alston’s excitement about applying to the School of Dance. Once enrolled, he adapted seamlessly. The guidance I have received from the faculty as a student—and as a working professional—is the one thing I have valued the most. “The guidance I have received from the faculty as a student—and as a working professional—is the one thing I have valued the most,” he says. Under their guidance, Alston blossomed in a single school year, dancing Sir Frederick Ashton’s “Birthday Offering,” Susan Jaffe’s “Metallurgy,” George Balanchine’s “Allegro Brilliante” and five roles in UNCSA’s annual production of The Nutcracker. He also had the opportunity to learn about the art of capturing a dancer’s form when photographer Dane Shitagi worked with UNCSA students for his acclaimed Ballerina Project in 2015. Alston fulfills a similar role at Charlotte Ballet, where he serves as a professional mentor for Texas Future Dance Educators, sharing his experience with students who plan to pursue dance in higher education or for future careers. Joining Charlotte Ballet has also increased his opportunities to experience new aspects of dance. Dwight Rhoden’s “The Groove” provided an educational experience for Alston, who noticed that his movements had been safe and slightly reserved. “It pushed me to step out of my comfort zone and be even bigger,” he says—something he looks for in each piece that he tackles. Alston’s first principal role with the company, in Sasha Janes’ “The Red Dress,” was challenging. “I’m excited to be challenged in a new way, with very quick movements, lots of allegro—both grand and petit and sudden changes of direction throughout my variation,” he says. Above: Alston practices for his role in "Sleeping Beauty." 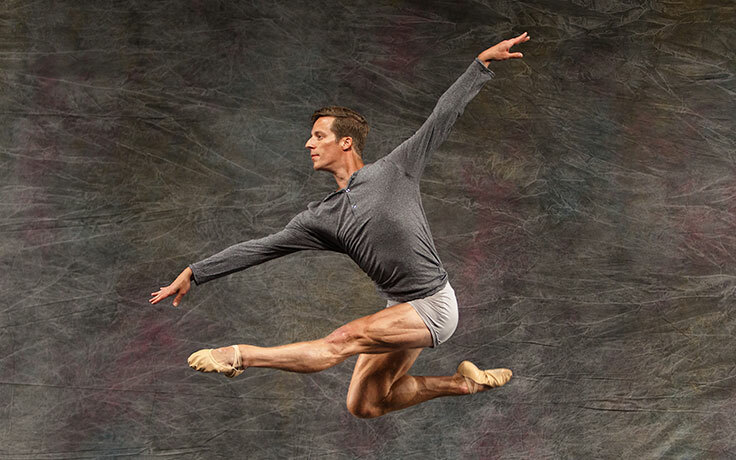 In his second season with Charlotte Ballet, Alston keenly looks ahead to the future, where he hopes to experience as much as possible.